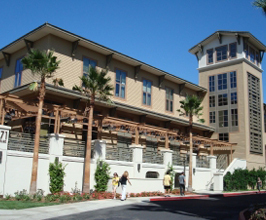 Sandhu includes both traditional rooms and residence hall suites. Sandhu is also a conference center that can host more than 500 conference-goers with hotel-like guest suites for visiting speakers and VIPS. View of the old campus maintenance shop and gasoline pump, Chapman College, Orange, California. Both were removed for mall construction. 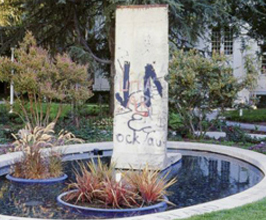 Liberty Plaza, a landscaped setting showcasing a section of the Berlin Wall. 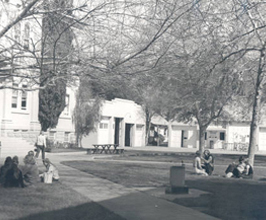 The Facilities Management Department's mission is to support, maintain, and improve the campus infrastructure for students, faculty, staff and visitors, while preserving the University’s physical heritage for future generations. As stewards of the campus physical resources, our services are directed toward the pursuit of excellence in support of the educational, research and community objectives of Chapman University. Management provides landscaping and grounds maintenance including irrigation, storm clean-up, pruning and upkeep of trees/bushes, maintenance of the stadium football field, and repair and replacement of campus vegetation as required. 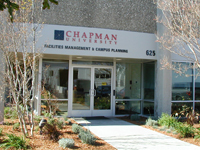 Chapman University located in the heart of Historic Orange has five university buildings on the Historic Register. The oldest building on campus, Wilkinson Hall, was built in 1904. Visit Campus Planning for information regarding space enhancements requests. 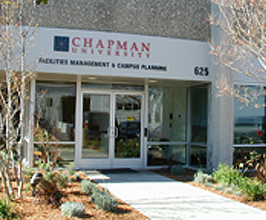 Email us at facmgt@chapman.edu or call us at (714) 997-6658.